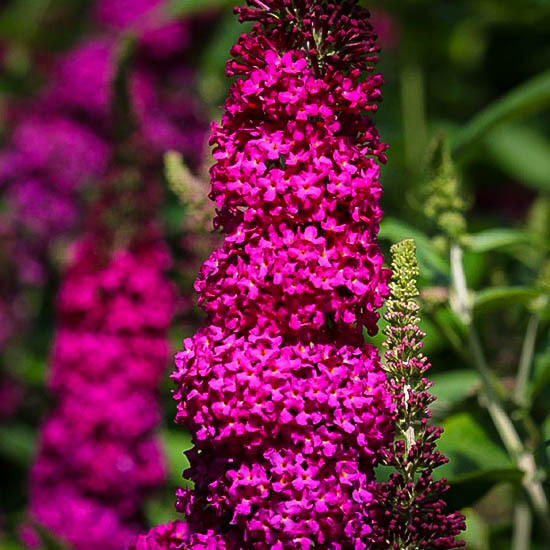 The Miss Molly Butterfly Bush is a new, non-invasive variety of this popular garden plant. It is very easy to grow in a sunny location in well-drained soil, and it will bloom continuously from mid-summer to the end of fall. It is a medium-sized bush, growing no more than 5 feet tall, and the same across. It grows as a dense clump of arching branches, with long, tapering soft-green leaves. The flowers are brilliant fuchsia-pink, and they are clustered in spikes about 4 inches long. 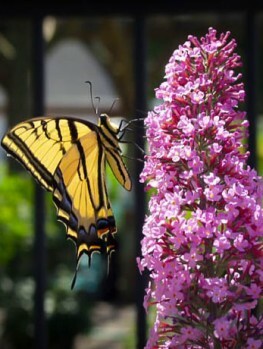 This plant attracts many different varieties of butterflies to the garden, as well as hummingbirds. 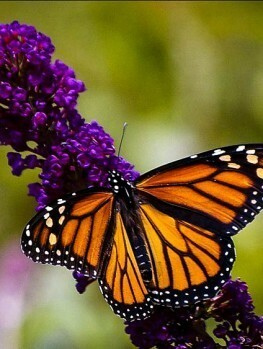 Children love to watch the butterflies, and this is the perfect plant for a children’s garden. Plant it among other flowering shrubs, or among annual and perennial flowers. It also grows well in tubs and pots, and does not need much care, as it is drought resistant once established. 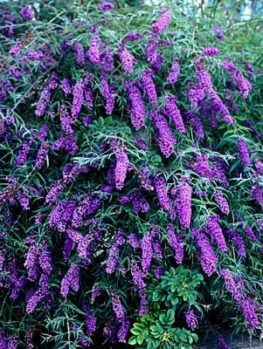 Choose a sunny spot in well-drained soil for your Miss Molly Butterfly Bush. It is hardy to zone 5 and has no significant pests and diseases. Flowers can be trimmed once they fade, but this is not really necessary, as they do not produce seed. Spring pruning is desirable, and is the only care needed for this tough plant. In colder areas it may die back to the ground in winter, but it will re-sprout and come back strongly, as soon as the warmer weather returns. 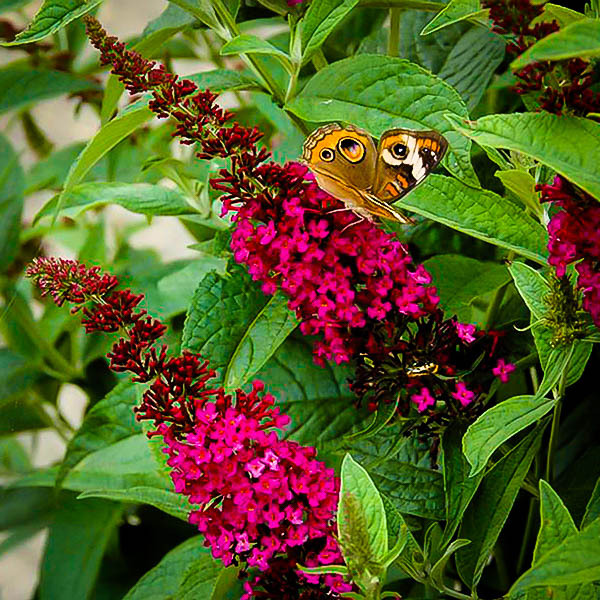 Everyone loves butterflies, and the butterfly bush is a guaranteed magnet for them in your garden. These classic bushes have been grown in gardens for many years, but in recent years we have become concerned about them spreading and invading wild areas. Here at the Tree Center we take environmental concerns seriously, and so we have sought out special varieties of this popular plant that are safe to grow anywhere. They do not make seed, so they cannot spread. These varieties can be sold in the states of Washington and Oregon, under the name ‘Summer Lilac’, as they have been tested and approved by regulators. 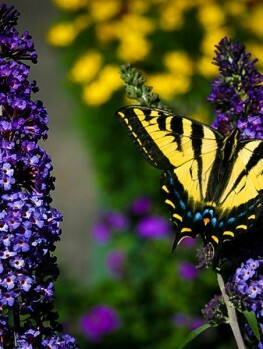 Both these states ban the sale of regular butterfly bushes. Among the very best of these new, non-seeding varieties is the ‘Miss’ series, and ‘Miss Molly’ really does make you want to say, “Good Golly!” This spicy lady is the color of a bright pink fuchsia flower, and she brings her vibrant color into your garden from mid-summer to late fall. That is also the time of year when butterflies are about most, so your bushes will be smothered in beautiful butterflies of all kinds. Children love to see the beauty of these plants and their insect friends. Hummingbirds too love to visit these fragrant flowers, and you will too. 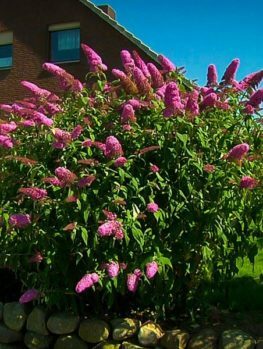 The Miss Molly Butterfly Bush is more compact than older forms, growing no more than 5 feet tall, and it has much denser branching too, producing more flowers in a smaller space. The long, tapering leaves are an attractive soft-green color and the flowers are carried at the ends of the branches. The flowers are small, but they are clustered in long, tapering spikes, that are over 4 inches long and over an inch thick. Each head of flowers contains about 150 of the tiny flowers, which are a vibrant fuchsia-pink color, and scented. Flower spikes are produced continuously from mid-summer until frost. They will not produce seed, but simply wither and fall, or they can be trimmed from the bush once they fade. Continuous bloom is a big feature of this plant. It will flower and flower, from mid-summer all the way into fall, and right up to the end of fall too, or until it is stopped by a hard frost. 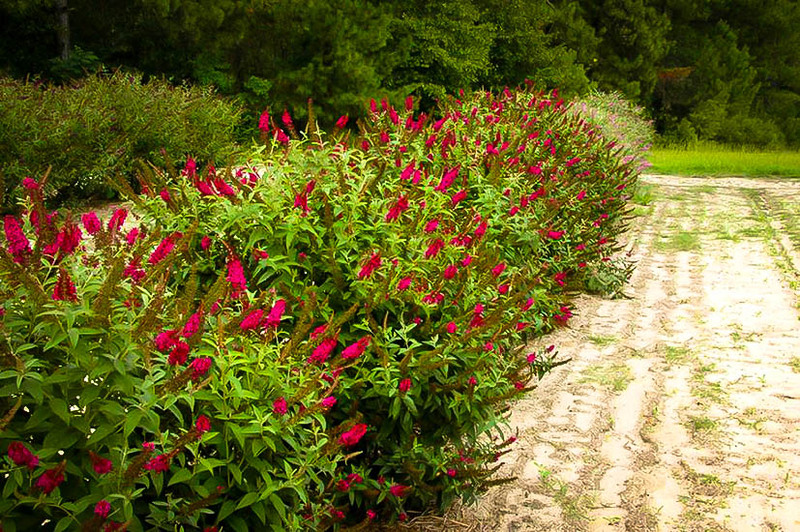 Just this one bush will bring months of flower to your garden. 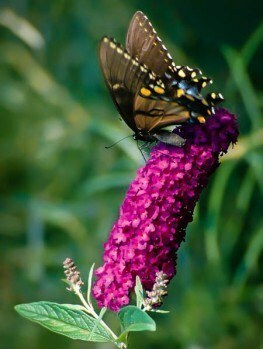 The Miss Molly Butterfly Bush can be grown in lots of ways in the garden. You can plant it among other sun-loving shrubs, for a colorful mixed-shrub border. You can plant it among annual and perennial flowers, as part of a flower border. Place it near where your children play so they can enjoy the kaleidoscope of butterfly visitors. Grow it in a large pot, perhaps with some annual flowers around it, as a great feature on your terrace or patio. A row makes an interesting way to separate one part of your garden from another – perhaps the vegetables from the flowers. 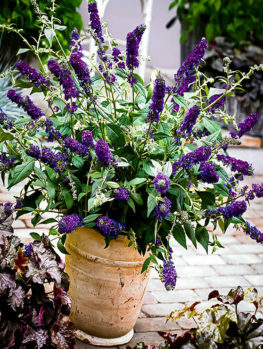 Plant your Miss Molly Butterfly Bush in a sunny location in well-drained soil. This plant needs at least 6 hours a day of direct sunlight, and preferably more. The soil should not hold water, especially in winter, as wet winter soil can kill the plant. Avoid low-lying spots for planting. This plant is hardy to zone 5, and thrives in hotter areas too. It will grow well in all types of soil, including sandy soils, where it is especially valuable and will certainly thrive. Some simple spring pruning of your bush is a good idea, and will help produce the most flowers. Wait until your plant begins to sprout before pruning, as this will guide you. Cut back any parts that have not sprouted to the buds that are sprouting. Remove thin shoots, leaving a framework of short, sturdy branches. In zones 5 and 6, depending on the location and how severe the winter is, plants may die back to the ground. Do not worry, they will re-sprout and bloom as expected, because blooms are formed on new wood. If they do re-sprout from the ground they may not reach the full 5 feet of their potential height, but they will bloom well and be a great joy in your garden. 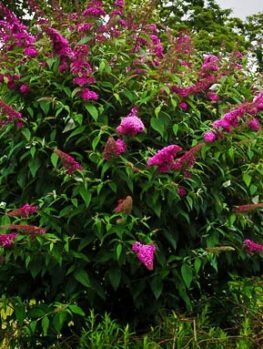 The butterfly bush (Buddleja davidii) is native to China, growing in open, rock areas. Wild plants can grow 12 to 15 feet tall. The plant was first found by the French missionary and naturalist Pere Armand David in 1869, growing near the border between China and Tibet. Once brought to the West it was bred and changed into many different varieties, and other species were also used in breeding, so today’s plants are almost all hybrids. Following concerns about Buddleja spreading, plant breeders set to work producing sterile plants that would not produce seeds, and therefore could not spread. Dr. Dennis J. Werner, a professor of horticulture at North Carolina State University, and a fellow professor, Layne Snelling, were among those who devoted themselves to this. ‘Miss Molly’ was produced by crossing two other varieties of Buddleja. One was called ‘Attraction’ and the other, which is an earlier ‘Miss’ series plant, is called ‘Miss Ruby’. That plant was developed from an older Dutch variety called ‘White Ball’. ‘Miss Ruby’ is also available from us here at the Tree Center. ‘Miss Molly’ was picked from the seedlings that resulted, because of its outstanding color and form. It was tested to ensure it did not seed. This patented plant was released in 2011.